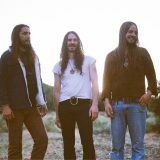 Radio Moscow is a hard rocking psych power trio. They have five albums on Alive Records and have toured USA, Europe, So. America and are heading your way. Trends come and go, but the idea of a bunch of guys getting together in a garage and playing the kind of music that makes the neighbors call the cops — that’s forever. And it’s that idea that’s crystallized in the form of Radio Moscow. The power trio led by the Stratocaster genius Parker Griggs have found THE formula: Crunching, heavy Sabbath-style chords topped with fiery solos that earn the right to be called Hendrixian. RN plants their flag firmly in the territory where psychedelic rock and cranked-up blues meet. The sound is unabashedly retro (think Cream, Blue Cheer, Led Zep or Jimi Hendrix Experience)’ so it’s easy to see how it caught the ear of the Black Keys’ Dan Auerbach, who produced Radio Moscow’s 2007 self-titled debut. With Brain Cycles, their second album, Radio Moscow proves that they’re not a cheap time machine but a direct descendant from the golden age of rock ‘n’ roll. In 2011, Griggs continued his psychedelic trip with The Great Escape of Leslie Magnafuzz released by Alive Records. 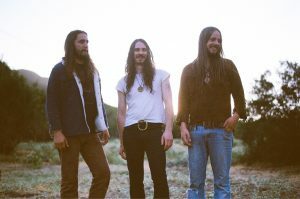 In June 2014, and still with Alive Records, the band released their most recent album Magical Dirt. Parker, Anthony and Paul hit the road hard in the U.S. and in Europe, touring with the likes of Graveyard, Witchcraft, Joe Bonamassa, Pentagram, Nebula, and Bang. The recently completed Up in Smoke tour in Europe (with Colour Haze) was followed by an appearance on the legendary German television program Rockpalast, where the band performed a set, played acoustic and was interviewed. Upcoming, they’ll be sharing the main stage with Kylesa and Earth at Psycho California at the Observatory in Santa Ana, CA., and back to Europe for six festival performances and hall shows. “I would be lying if I did not say I have been completely taken with this, the fourth album from lovingly/freakishly retro combo Radio Moscow—a fabulous trio from Iowa including the amazing guitarist/singer Parker Griggs, bassist Anthony Meier and drummer Paul Marrone. With an album cover that absolutely evokes another album I have seen in my lifetime but simply can’t remember—must be the font, you’ve got to love these guys—the band actively evokes all that was great about hard-rock trios of the ‘60s, the Blue Cheers, the Creams, etc., but does it with such gleeful abandon you’ve got to admire both their spirit and whatever time capsule they rode in on. Great fun.” Dave DiMartino, Rolling Stone. Blues. 60’s Psychedelics. 70’s rock.